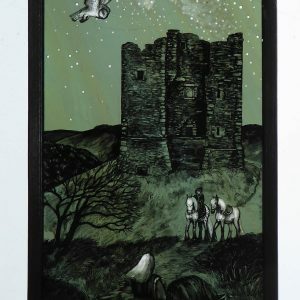 Tamsin Abbott completed a degree in English literature (First Class Honours) at Stirling University (1985 -1989) where she specialised in medieval literature. Her love of the language and stories of medieval literature was enhanced by the fact that much of the research material she was reading was illustrated with paintings and simple woodcuts of the period. After leaving university Tamsin moved to Herefordshire and returned to college to complete a foundation year in art at Gloucester College of Art and Technology where she discovered the highly influential work of the Brotherhood of Ruralists. In 1999 she began an evening class in stained glass at Hereford College of Art and Design and soon gained an OCN in the craft but continued the course for a total of four years. 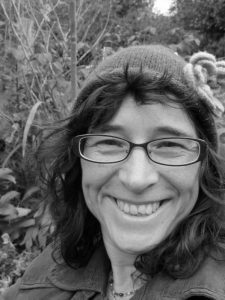 Tamsin works from her studio in the Herefordshire countryside where the orchards, the hills, the woods and all the plants, birds and animals influence her work. 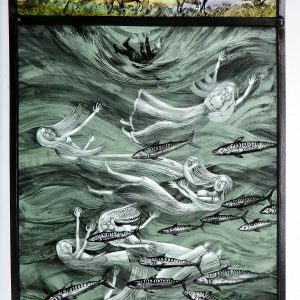 Twenty Twenty Gallery are delighted that Tamsin will be collaborating with Hannah Willow and Twenty Twenty Gallery to curate a unique exhibition ‘Lyrics of the Land’ 22nd September to 13th October at Much Wenlock. Click here for more details.